Dolphin Calf and Mother Safely Disentangled From Marine Debris in Banana River, Fla.
CAPE CANAVERAL, FLA. (JANUARY 25, 2017) – Earlier last week, Georgia Aquarium Conservation Field Station (GACFS) responded to a call of a dolphin calf seen entangled in marine debris alongside its mother. With partner institutions, GACFS was able to assist with assessing and freeing the calf. The calf was seen tangled in recreational fishing gear and swimming alongside its mother. At that point, partner institutions - Sea World Orlando, HUBBS Sea World Research Institute, Harbor Branch Oceanographic Institute at Florida Atlantic University, Clearwater Marine Aquarium, Florida Fish and Wildlife Conservation Commission, and University of Florida – devised a plan to help this animal. 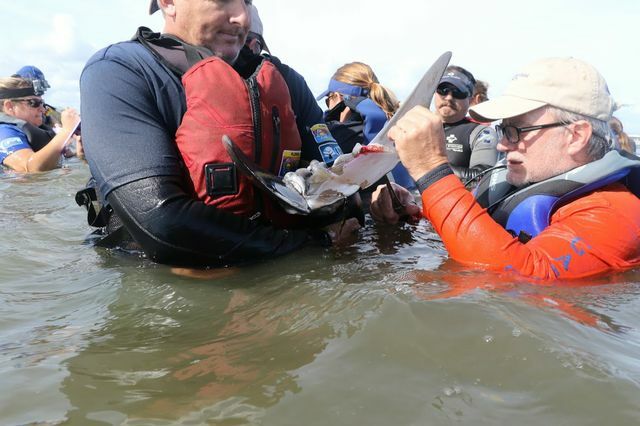 The National Oceanic and Atmospheric Administration’s National Marine Fisheries Service (NOAA Fisheries) authorized and oversaw the rescue of the dolphin calf and its mother. The calf and mother were spotted near Cape Canaveral, Fla. in the Banana River. Once the teams were able to assess the animals, it was discovered that the calf had wounds on its tail fluke. The wounds appeared to be from multiple wrappings of monofilament and braided fishing line. This fishing gear is presumed to have been attached and trailing the calf for a lengthy period of time due to algae and other growths. The gear was heavy and had been entwined for long enough to create substantial cuts into the calf’s tail fluke. Veterinarians on-site removed the debris, performed a full medical exam, and administered a long-term antibiotic to aid in the healing of the tail wounds. A radio tag was also attached to the dorsal fin of the mother so that researchers from HUBBS Sea World Research Institute can conduct post-monitoring of the pair. Approximately one hour later, both calf and mother were released and seen behaving normally and socializing with other dolphins. Dolphins and other marine life face many challenges in the wild, including exposure to discarded trash and fishing gear. GACFS is dedicated to the rescue and research efforts of marine life in north Florida and is a member of the National Marine Fisheries Service Marine Mammal Stranding Network, which allows GACFS to work with a variety of government agencies and non-profit institutions in response to dolphin and small whale strandings or distress calls.